8/26/2008Share this story on Facebook! 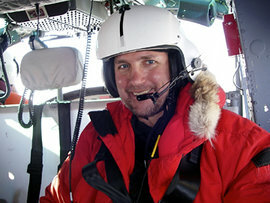 While onboard the Oden, Allan Miller kept a journal, posted photographs, and conducted teleconferences for K-12 classrooms around the country as part of PolarTREC (Teachers and Researchers Exploring and Collaborating), an educational research program funded by the National Science Foundation and designed to improve science education. Read NASA's feature on Allan Miller. For some people, exploration is just a hobby. For Allan Miller, M.S. ’97, it’s a lifelong passion. He’s a licensed pilot, and in 2003 he was a finalist to become an educator astronaut with NASA. Last December Allan joined an international team of teachers and scientists on one of Earth’s ultimate ventures -- a two-week research cruise to Antarctica on the Swedish icebreaker Oden. 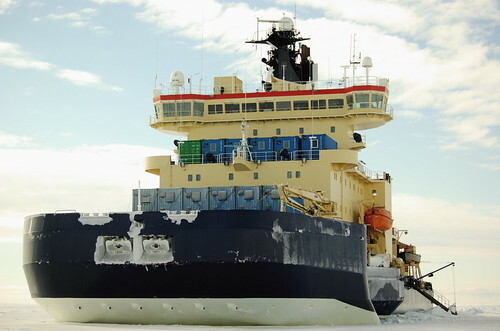 Here's a view of the massive Swedish icebreaker, "Oden." The trip was sponsored by the National Science Foundation (NSF) as one of the first activities for the International Polar Year, a global research campaign in the Arctic and Antarctic, and Allan went along as an NSF educator-researcher fellow. Watch adelie penguins scurry out of the way as the "Oden" arrives at McMurdo Station on Ross Island in Antartica. A year ago, Allan was teaching sixth grade in the Kenai Peninsula of Alaska when the NSF asked him and his family to move to the nation’s capital for a year as part of the Albert Einstein Distinguished Educator Fellowship. This program of the Triangle Coalition for Science and Technology Education brings math and science teachers to Washington, D.C., for a yearlong fellowship with federal agencies. Allan’s job was twofold: he was a consultant on K–12 education, and he furthered his own professional development by bringing back to Alaska what he learned from the fellowship. Allan’s role on the Oden expedition was primarily one of educator, using shipboard telecommunications to create journals, post photographs, and conduct teleconferences for K–12 classrooms around the country. He also served as research assistant, working alongside scientists from the United States, Sweden, and Chile who conducted a multitude of observations. One of the most interesting things he assisted in was the Antarctic Sea Ice Processes and Climate Project, a worldwide effort to collect data that are being used to create computer models showing how sea ice is changing in relation to global climate change. While Allan says that the Oden expedition made him “reinvigorated as a lifelong learner” and opened his eyes to the natural beauty of the Antarctic region, he embarked on it as no stranger to international experiences. He worked with the U.S. biathlon team and in 1996 married Joan Smith, a two-time Olympic biathlete who competed in Albertville and Lillehammer. Allan has also taught in Russia and was part of a team that helped develop student exchanges with the isolated city of Magadan, in the Far Eastern Federal District, which had been a transit center of the Stalinist labor camp system. In 1990 Allan started taking regular teams of students and teachers on exchanges and visits to study in Magadan schools. That’s hardly a surprise for an adventure lover like Allan. My tenure as an Einstein Fellow, including the month working on the Oden, was instrumental in forging a newfound desire to see a resurgence in science education throughout my home state of Alaska. The year I was able to spend at the National Science Foundation was an incredible opportunity to see some of the amazing work that is being done by researchers in all domains of science, as well as the passion scientists have to achieve new understandings and breakthroughs for the benefit of all mankind. It also highlighted a huge problem. Rather than experiencing this awe-inspiring excitement of cutting edge scientific discovery, all too often young people come away from school with the perception that science is about memorizing facts, reading texts and completing worksheets. Hoping to have an impact broader than my role as classroom teacher, this past fall I accepted a new job as a mentor teacher, consulting with sixteen first-year math and science teachers in three Alaskan school districts. In sites ranging from the state's largest high school in Juneau to the 25 student high school in the Yupik Indian village of Kasigluk, it has been my job to work one on one at each site observing, providing feedback, modeling lessons, and sharing resources. In comparison to this job, the trip to Antarctica now seems almost domestic compared to the 72,000 air miles I've logged, and balmy compared to a few snow machine rides (the Yupik "school bus") at 40 below! Despite the exhaustion of long days ("I know it's midnight, but can you help me figure out a better way to teach genetics") and sleepless nights on hard library floors, it has been very rewarding to be part of some great lessons throughout the year. I've even had the chance to share my Antarctic adventure -- and found it is just as engaging for kids on the opposite side of the world. At least the penguins are -- as for the ice and cold, that's nothing special.